An answer to a query from nt. Putting it on the blog, as it is a very relevant topic, and worth discussing again. 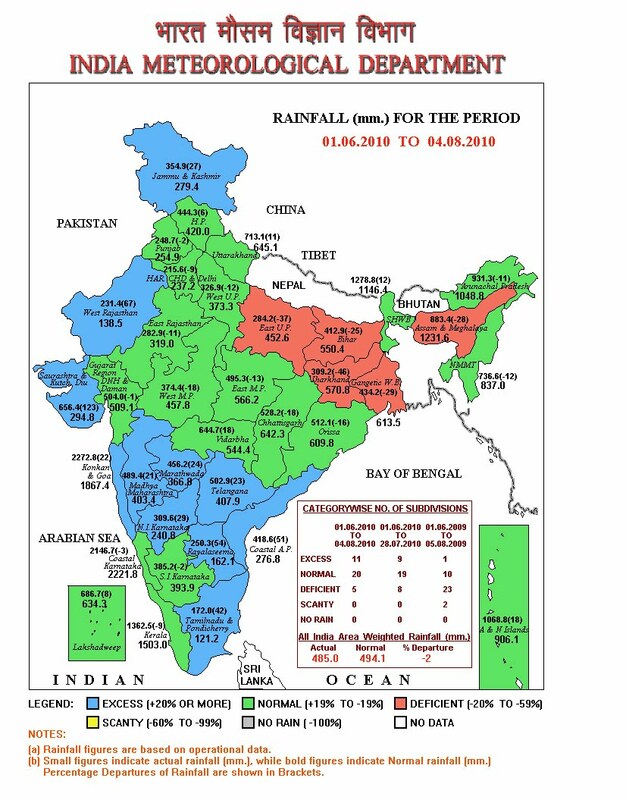 I have given my views on this in an earlier blog, about 2 years back, when IMD had put up their "vague" estimate and forecast of the Monsoon that year. And I don't mind repeating, as I do not expect readers to go thru the archives of "vagaries". referred to the whole of India. Our country is too vast and diverse, and the overall estimate of quantum is mis-leading and cannot depict the real picture at all. If, say, like in this year as yet, we see the Bihar/Jharkhand/southern Bengal/Assam region in deficit. But we see the west like Gujarat/Maharashtra/ W.Rajasthan in excess. The south seems to be normal, with excess in T.N.. So, even if Bihar has a deficit of, say, -25%, and Gujarat has a surplus of ,say, +25%, the overall shows a normal rainfall. People in Gujarat will complain of excess, and Bihar will cry drought! 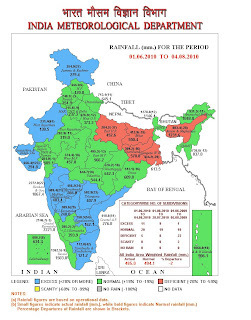 IMD also has a regional forecast system intact, besides overall country rainfall. ns of India, NW India, Central India, South Peninsula and NE India, multiple regression (MR) models based on separate set of predictors are used. All the four multiple linear regression models have model errors of 8% of LPA. So, for regional, for an estimated 100% rainfall, anything from 92% to 108 % is normal ! Anything from 92%to 108% is "we told you so" ( quite a wide margin, and very easy to forecast with this yawning margin). That's not all. The model error of the ( all India) April forecast system is 5% and for the June forecast system, it is 4%. So even if overall it is +_ 5%, it is considered normal. So, if IMD gives a forecast of,say, 98%, any rainfall (overall), from 93% to 102% is "normal" as per IMD. For issuing the forecast for the seasonal rainfall over the country, a new statistical forecasting system based on the ensemble technique is introduced in 2007. The 8 predictors considered for the new ensemble forecast system. For the April forecast, 5 predictors are used. For the updated forecast in June, 6 predictors that include 3 predictors (first 3 predictors ) are used. I personally feel, that the previous system, where 16 parameters were used, was better, and more accurate. Results could be tallied. the Himalayas. Lull for the regions south of the Himalayan foothills. The next MJO is due to activate in our region around the 20th, but things could move before that . my views and comments to that. During the monsoon break, the day temperatures are expected to rise substantially. reas, I estimate the days to be around 34/35c in the next week. Mumbai: Very scattered passing showers this week. Sunny intervals, and "not much hindrance" from rains. Only few showers of short durations.Conditions of less than 10 mms of rain per day, Monday thru Friday. Good week to catch up on "rain affected" works. Days expected to be hot, at 32c.